The training series on “Quality Infrastructure” with the aim of empowering the MEDT of Ukraine to implement the DCFTA/AA with the European Union successfully continued under the guidance of Anne Bercio, Project Leader at IEP. After dealing with Market Surveillance, Accreditation and Conformity Assessment in the preceding trainings, the fourth workshop from 26 – 27 April in Kyiv focused on Metrology. A Slovenian expert acquainted the participating group of more than twenty state officials with the importance of market surveillance in the field of measuring instruments and best practice examples from other countries. 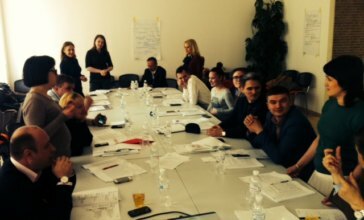 Supervised by Anne Bercio, the participants are compiling a User Manual on Quality Infrastructure for Ukrainian producers. This manual was presented and published at the end of the training series in June.